The room was confortable, the bathroom was also fine. The breakfast is very good, many bread options, some fruits, drinks and tasty donuts. Checkin and checkout very quick and easy. The hotel is clean and quiet. The breakfast was perfectly OK. The staff was very friendly and helpful. The parking space is just enough and there were always places to stop. Very friemdly and helpfull staff. Without asking they gave us a room away from (party)guests who were staying there to visit a world festival in the neighbourhood. We had a very quiet and nice clean room. Former Etap hotel, but well maintained. Everything worked. The area is away from the city center, close to harbour and offices. Quiet stay, Very good to sleep for a short stay or for work/business. Free parking, which is a big advantage in this city. The room was comfy and definitely will meet your expectations. But the hotel is little far from the city. so if you are a tourist visiting antwerp city, you will need to be ready to pay for extra transport. the friendly staff, most of the basic things one needs for daily hygiene is available, and the breakfast buffet has enough to choose from to start one's day. you get value for your money. Room was clean with toilet inside. The car parking very useful. The beds were very comfortable. The shower water was very nice and hot! Location to Netherland border was great! Room had a double bed and a bunk bed on top of it, which is a convenient place to put extra stuff. Also, there are two chairs, a desk, a desk lamp and hangers. The onky downside is the number of electric outlets, would have been nice to have them by bedside. The free parking has plenty of space. The reception desk has free lemon water which is nice. I stayed over the weekend. Breakfast was good. Nothing hot or special (Bacon, sausage, etc.). Didn't expect it, but just to inform others. The hotel ibis budget Antwerpen Port has modern budget rooms with flat-screen TV and bright décor, 4 miles from Antwerp’s historic center. It features a 24-hour front desk and free Wi-Fi in public areas, and on-site private parking is available free of charge. 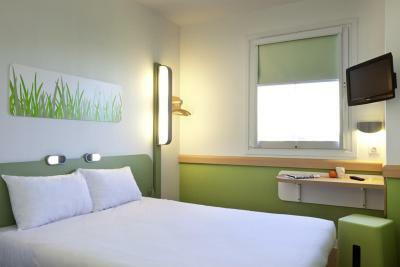 The air-conditioned rooms at ibis Budget Antwerpen Port are fully soundproof and include a small work desk. 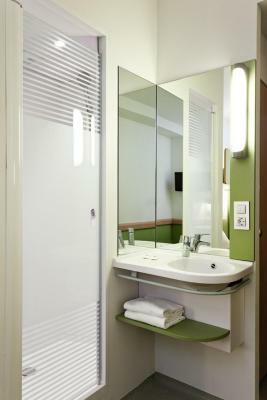 Each room also has a bathroom corner with a sink, shower and a separate toilet. Ibis is in the port of Antwerp and is 2 miles from Antwerp-Noorderdokken Train Station. The Dutch border is a 15-minute drive from the hotel. 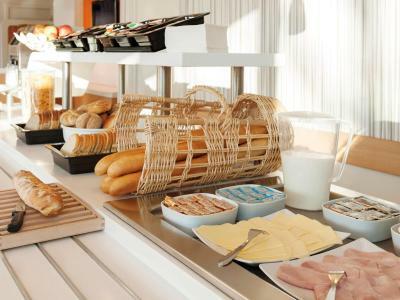 A buffet-style breakfast is served in the breakfast room each day. Guests can read one of the many newspapers and they eat. The hotel also includes vending machines with snacks and drinks in the lobby. 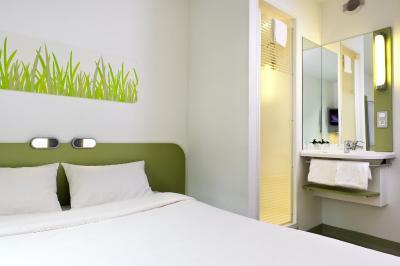 When would you like to stay at ibis budget Antwerpen Port? A single bunk is positioned above the head end of the double bed in this room. Air conditioning, flat-screen cable TV and a private bathroom with a shower are also provided. Flat-screen TV and a private bathroom with a shower are standard in this room. 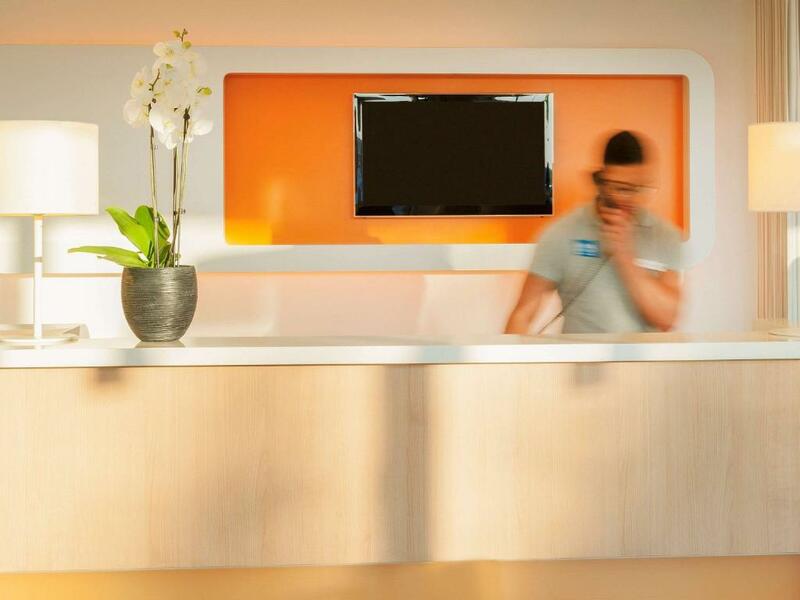 House Rules ibis budget Antwerpen Port takes special requests – add in the next step! ATM card ibis budget Antwerpen Port accepts these cards and reserves the right to temporarily hold an amount prior to arrival. ibis budget Antwerpen Port accepts these cards and reserves the right to temporarily hold an amount prior to arrival. 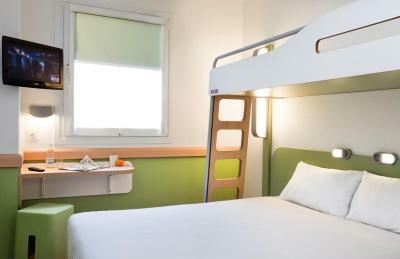 Please note that guests staying with children are requested to inform Ibis budget Antwerpen Port of the number of children and their age. Guests can do so by using the Special Requests box. Not enough power sockets in the room. In fact there was only 1 which was far away from the bed. In this day and age there should be several power sockets for laptop, phone, tablet. Also there was no desk. Each room had cigrette smell. I would not recommend for non smokers. Toilet room very small, paintwork cracking, heating didn’t work, lighting around the room didn’t work. Public connection was not that easy, as the Bus was not driving the day of arrival. Train is good, but still 20 minutes walking from there. A dead fly sticked at our ceiling. The staff was very friendly and it had a good location! The water pressure and temperature were very temperamental and made it unpleasant to shower. The boiled eggs were very cold at breakfast, were they kept in the fridge overnight? A cosy, clean, modern and simple bedroom providing all the basic needs. It was pleasantly quiet, beds are comfy. A good variety on offer at breakfast buffet. Location - every shop, restaurant, bar etc. are located far away. The most friendly and smiling staff I ever meet. Only few things available during breakfast, but their quality was excellent. Dirty, not very good location. Small room. Room with a view! I don’t think so. Small, simple room, old furniture. Really "Budget" hotel. Next day I moved to Novotel, next to this hotel. the staff were friendly, rooms are clean, and the breakfast buffet was something for everyone. Due to issues with booking System re-booked to neighbouring Hotel, all went well, good communication.